These clues infer a genuine prospect where Alvord cutthroat trout origins are concerned; and they irrefutably tell the story of what these rare trout are not. No one knew more about alvordensis than Dr. Behnke. From verifying the meristic characteristics of alvordensis; researching many historical records about these trout; and foraying into native alvordensis habitat in the search for any remnant of the trout – few researchers challenged Dr. Behnke’s knowledge and claims on the subject. 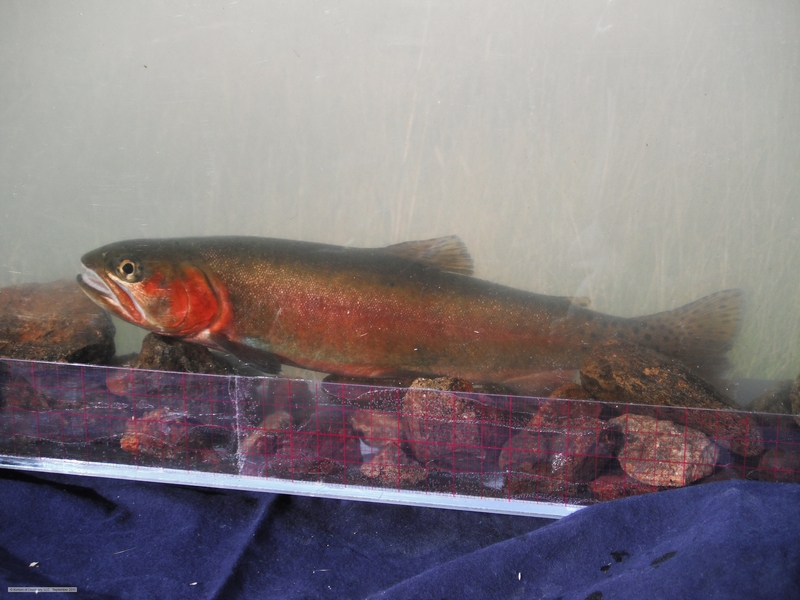 Yet over these years we have experienced a range of responses from personnel within ODFW regarding these trout and Dr. Behnke’s declaration that phenotypical alvordensis were present in this stream . 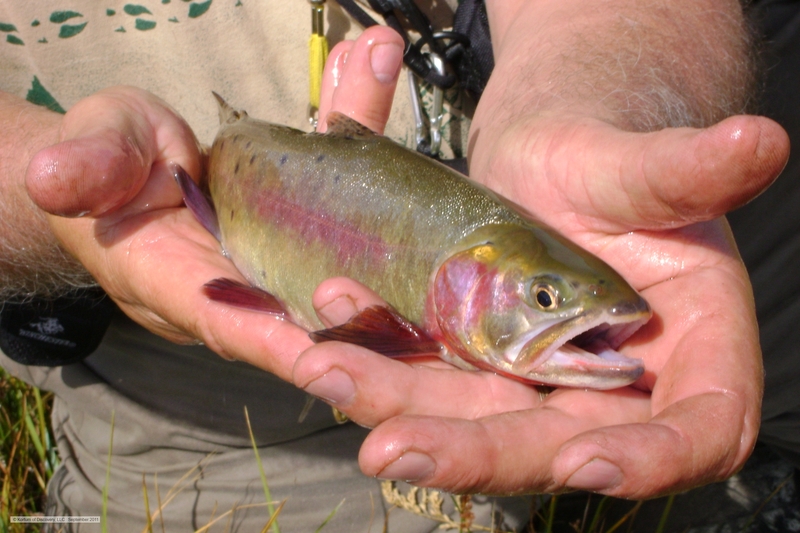 . .
And other biologists have been prone to deny the existence of Alvord phenotypes in any stream, including Guano Creek: Their thought is that the hybridization in this stream is simply LCT x rainbow hybrids, and that there is no “mystery” or any hint that trout were ever translocated here – except for those in ODFW’s records. 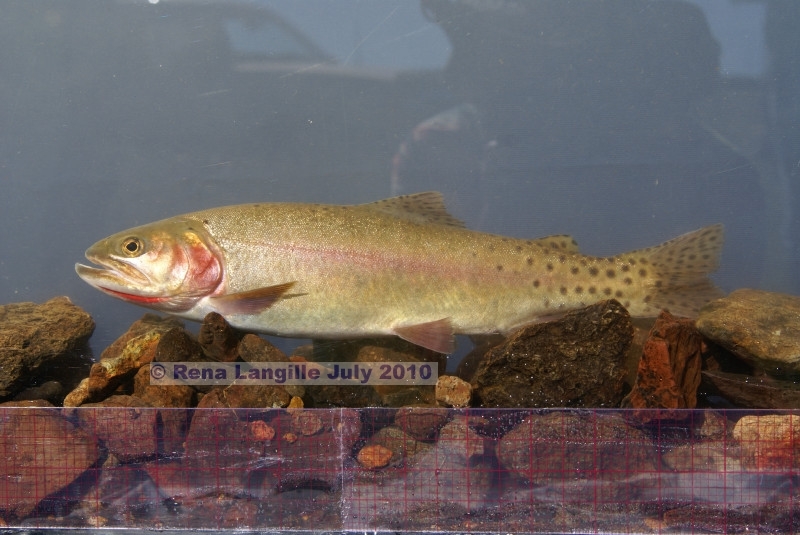 Though ODFW’s own sampling projects have not produced palpable rainbows in Guano Creek; their opinion is that Guano Creek was originally a redband trout stream, connected to Catlow Lake. Waterfall stretches in the canyon, and a marsh deemed to be impassible, might contest that claim; yet these barriers may not always have been so formidable . . . 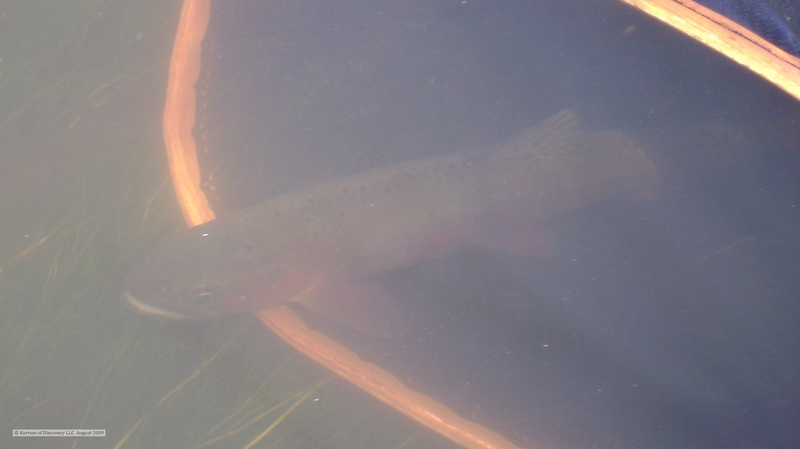 It is possible Guano Creek was the farthest southern stream with Catlow redband trout. Yet, whatever the ancient historical aspect of the stream may have been, we should not let that affect our thinking such as to deny contemporary reality. We’ve tried, but we have not found Alvord phenotypes – anyplace – except in this one stream. We have fished the Trout Creek system to its headwaters, and found solid rainbow strain trout – with no visible expression of alvordensis. 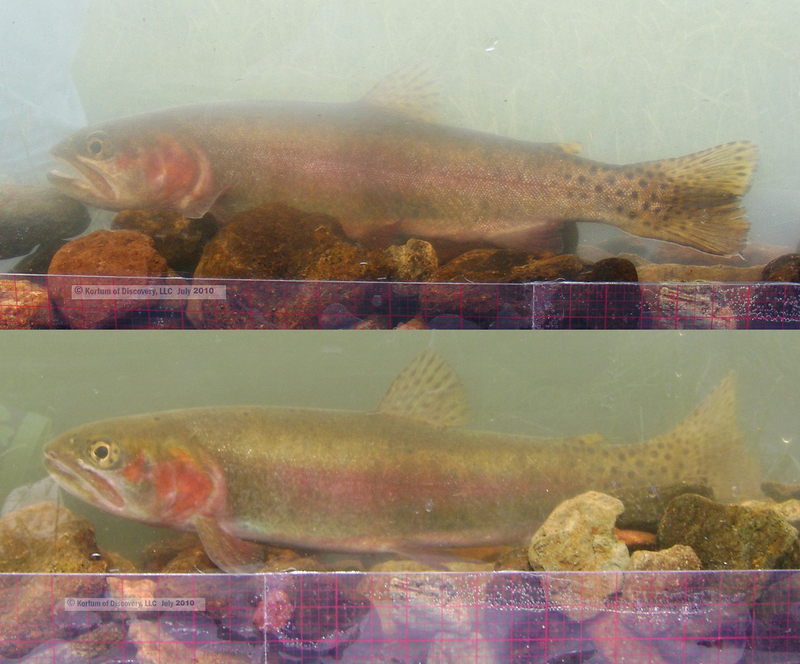 However, there have been trout in Guano Creek that have clearly expressed the phenotype of the Alvord cutthroat trout. 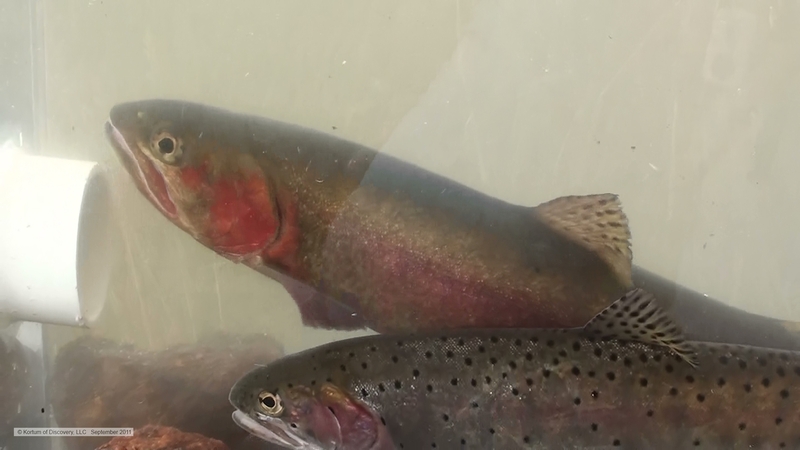 And now, there is specific genetic information that may constrain the opinions that have been so common regarding these trout and their adoptive stream that Dr. Behnke identified as a their surrogate home. 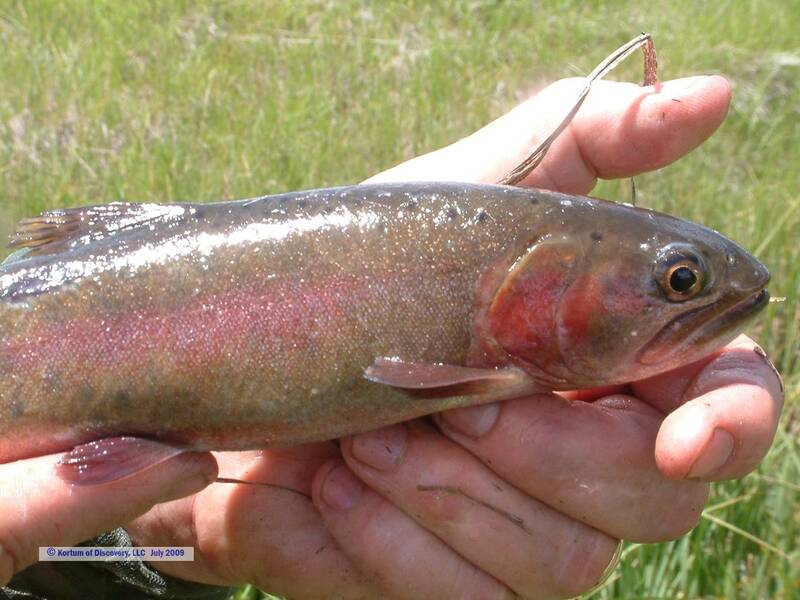 We’ve asked a few questions regarding origins of the Alvord cutthroat trout in Questions from the Pluvial Past. And we’ve seen evidence that boils down to few possibilities in The End of the Innocence or the Beginning of an Answer? Without the answers to be finally provided by genetic analysis of the Alvord cutthroat trout specimens at the University Of Michigan Museum Of Zoology we are still in that dilemma. Yet recent analysis by Victoria L. Pritchard, John Carlos Garza and Mary Peacock of the University of Nevada, Reno may shed light regarding the limited prospects and possibilities of alvordensis origins. Of course, we all know that to be true . . . . This is what led to the extirpation of the Alvord cutthroat trout from Trout Creek Oregon and Virgin Creek Nevada. I applaud the intellectual honesty here; that there is acknowledgement of Dr. Behnke’s thoughtful conclusion that Alvord cutthroat trout were transplanted from Trout Creek to Guano Creek, and acknowledgement that (at least some of) the streams that Coyote Lake sub-basin (Willow/Whitehorse Cr.) trout were transplanted into were not really fishless. Again — the intellectual honesty extant in this brief article is greatly appreciated. Admittedly, there are aspects regarding the Alvord cutthroat trout that we do not know at this time. And admittedly; there are aspects regarding the history of Guano Creek – and the trout there that are there, and how they got there, that we do not know at this time. 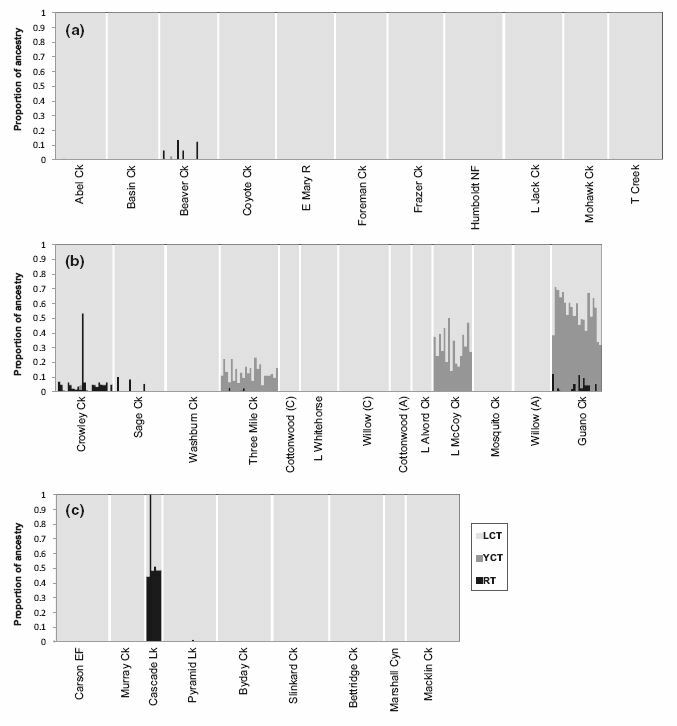 This article either presents the “smoking gun” indicating the heredity of the Alvord cutthroat trout — or else it “drives the nails in the coffin” regarding the prospect that there were usable Alvord cutthroat trout phenotypes that could have been saved and perpetuated from this small stream in SE Oregon. Ultimately, there is only one way to settle dispute and verify either side of the question. 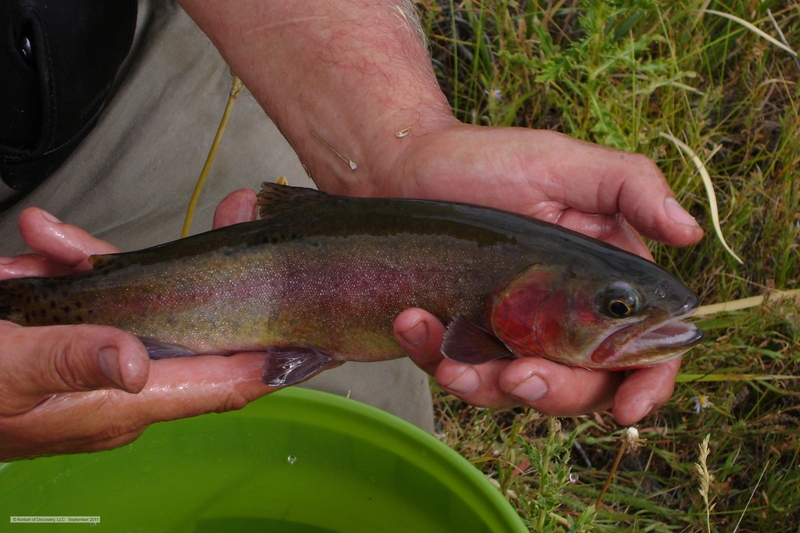 The preponderant strain of trout in Guano Creek is Yellowstone cutthroat trout heritage. 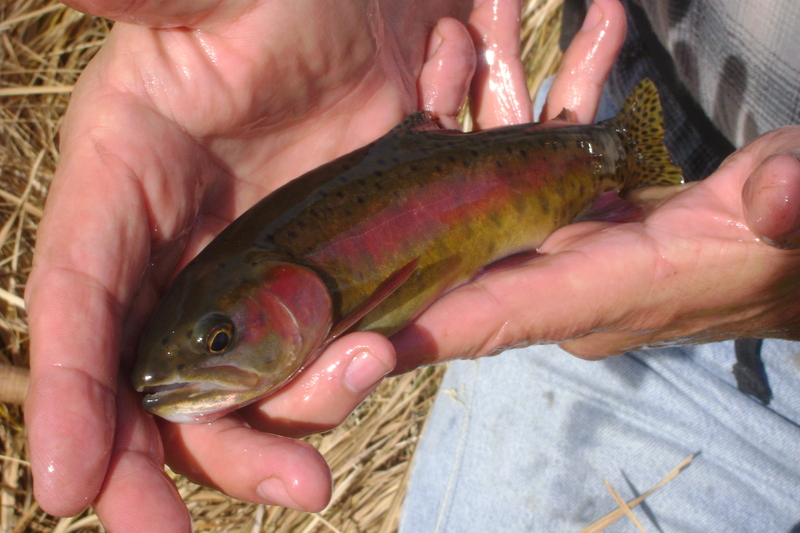 There are not sufficient Rainbow SNP’s in the mix of genetics for the trout from Guano Creek to yield perceptible rainbow characteristics. Of course, this would explain why the trout samplings ODFW has undertaken since 1992 have not yielded any discernible rainbow characteristics. 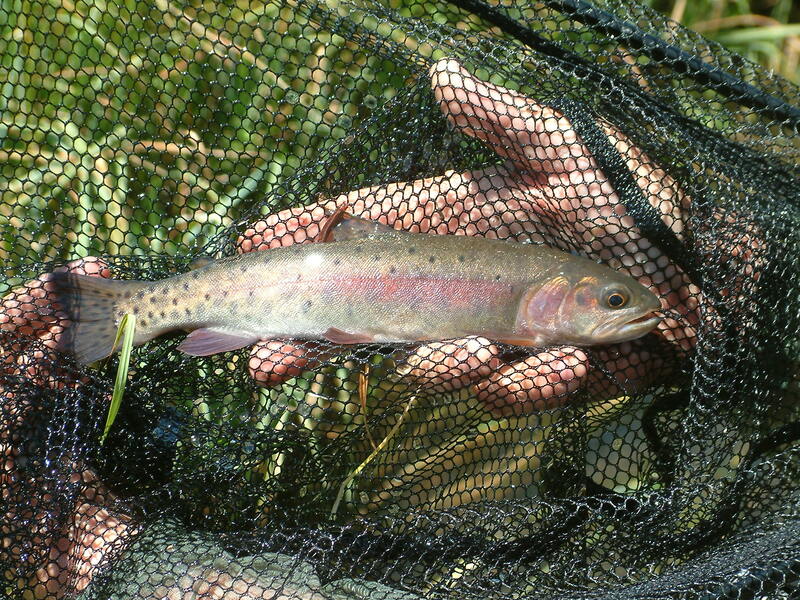 And, this could also validate Dr. Behnke’s conclusion that there was already a well-established cutthroat population in the creek before the introduction of other trout by ODFW began. There are only a couple of choices here. 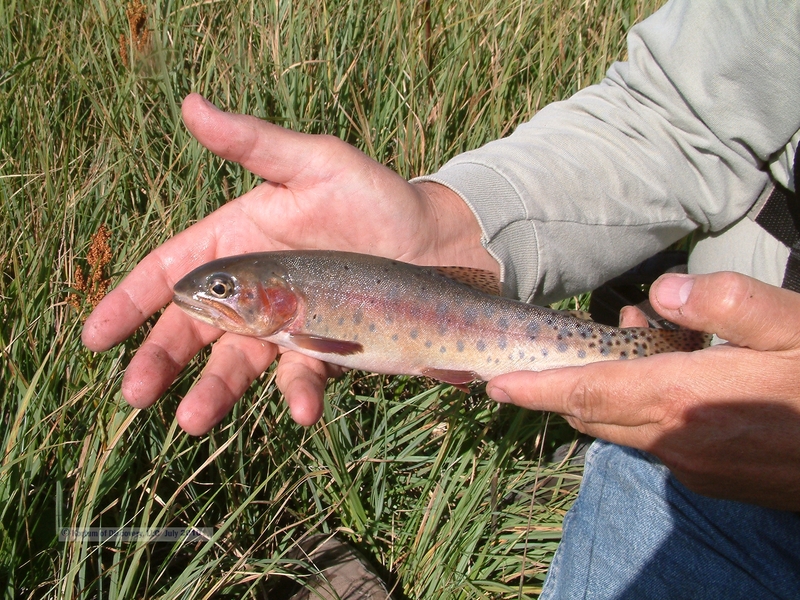 • Either Alvord cutthroat trout were adapted as a sub-species from early Yellowstone cutthroat trout heritage . . .
• Or, Yellowstone cutthroat trout were transplanted to this basin at a very early date. 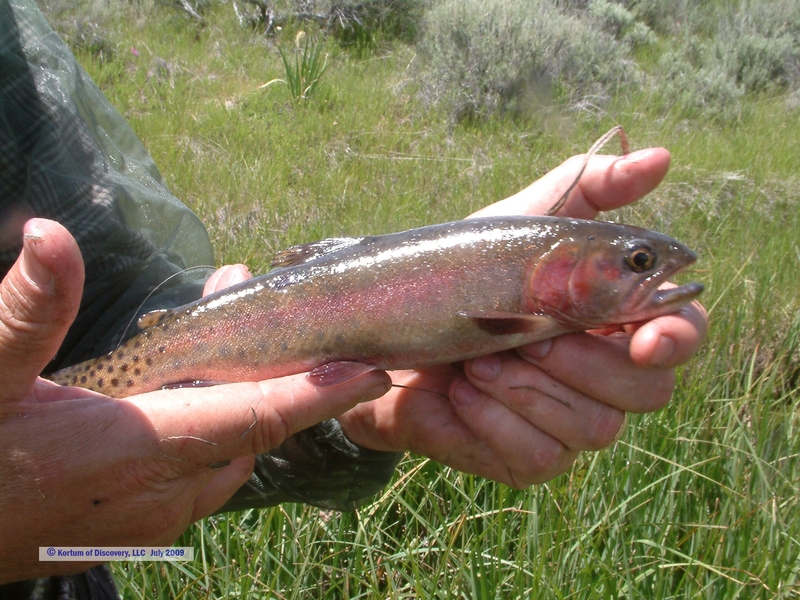 Though we have seen trout in Guano Creek that seemed to “shout” that they were Yellowstone cutts: there have also been trout that seem to defy explanation; other than that they were of Alvord cutthroat trout heritage. 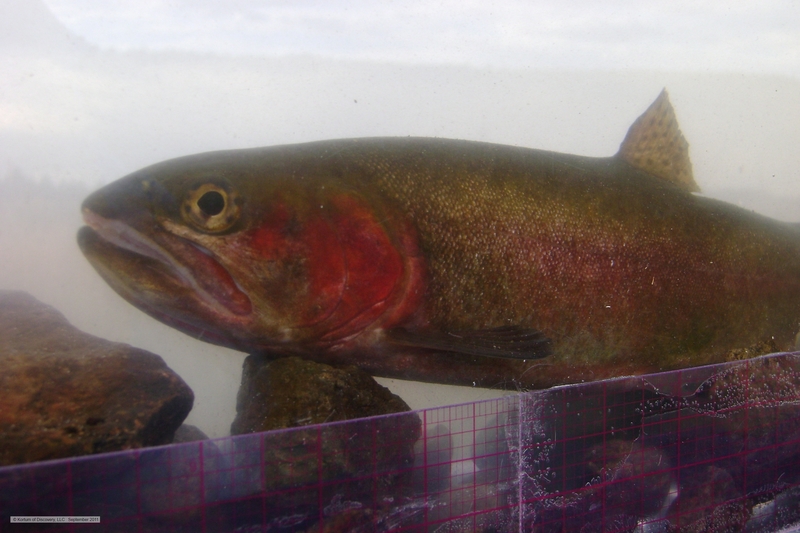 It is extremely odd that ODFW would conclude that the trout that were propagated from Guano Creek parents were rainbow hybrids, when there are not enough rainbow alleles in the population to reproduce rainbow characteristics. 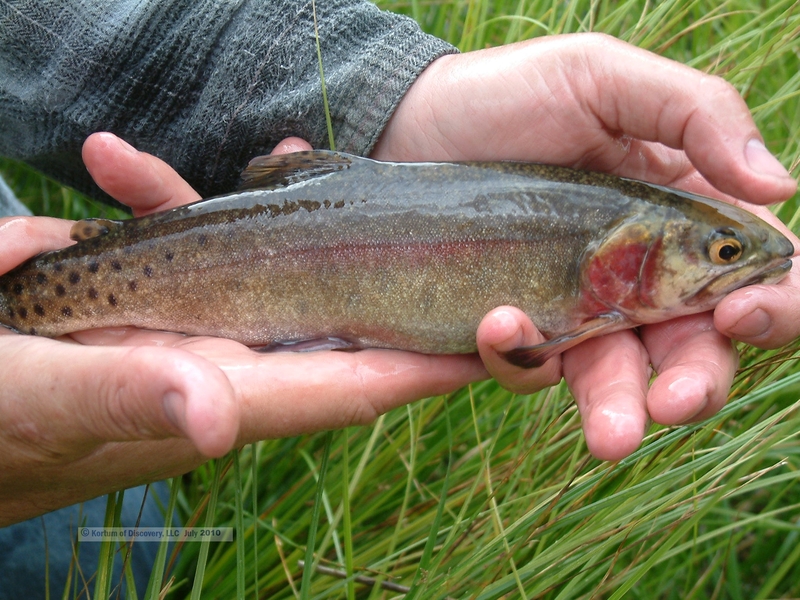 The study reveals that the Guano Creek trout are comprised of 52% Yellowstone ancestry, 45% of Lahontan ancestry, and just 3% Rainbow ancestry. Perhaps I should add that the specimens an ODFW biologist extracted from the stream in 2008, that were used for this study, were a broad, comprehensive, indiscriminate mix; i.e. 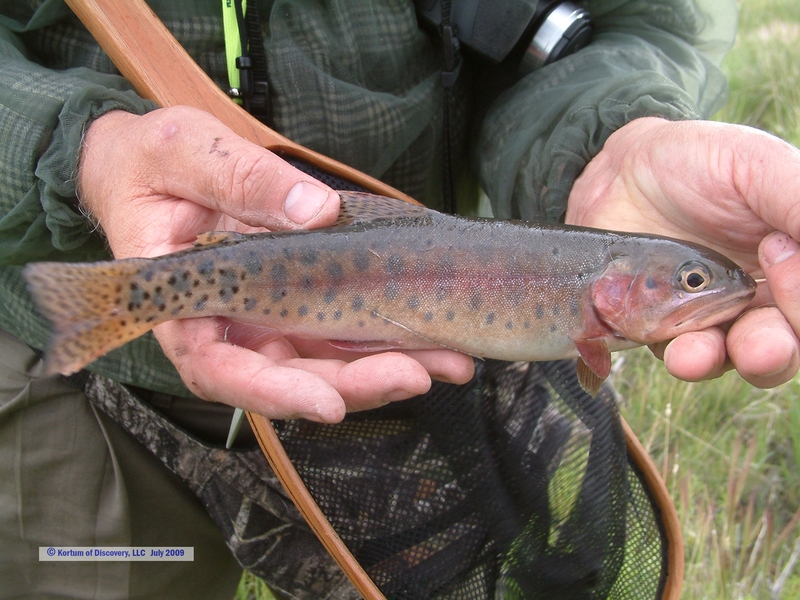 an objective cross-range of trout from this stream that would provide an accurate analysis or summation of what the trout in this stream are comprised of. The conclusion, and the whole outcome, from the Alvord phenotype hatchery propagation project seems very anomalous indeed, since the parents would have likely been from 97% cutthroat lineage. 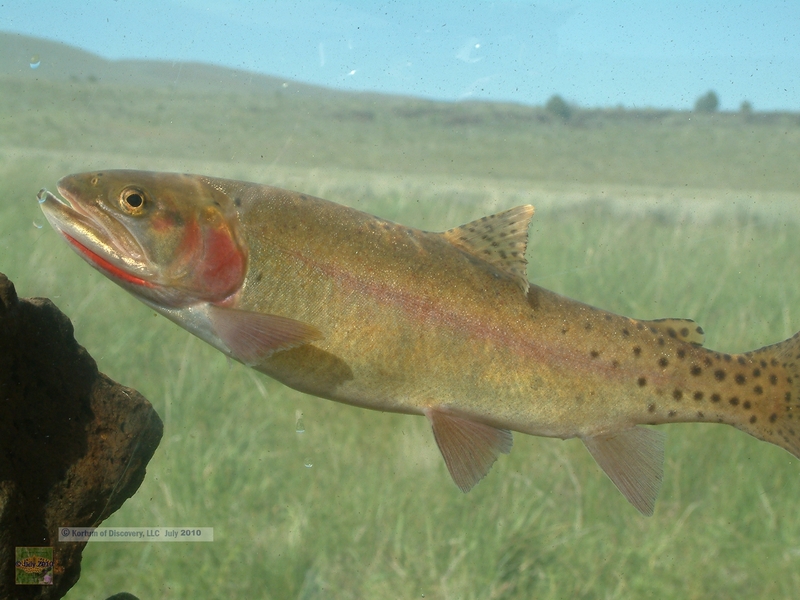 There are other reasons that I suspect that alvordensis may have been derived from very early strains of Yellowstone cutthroat trout. But there are too many unanswered questions that pervade this subject — and that need to be answered — before any genuine, ultimate, conclusion can be drawn. As was alluded in the last post: regarding any issue, our belief –or unbelief- often shapes our actions. If we believe Alvord phenotypes still exists in Guano Creek, then our actions will be to preserve the phenotypes at all costs. 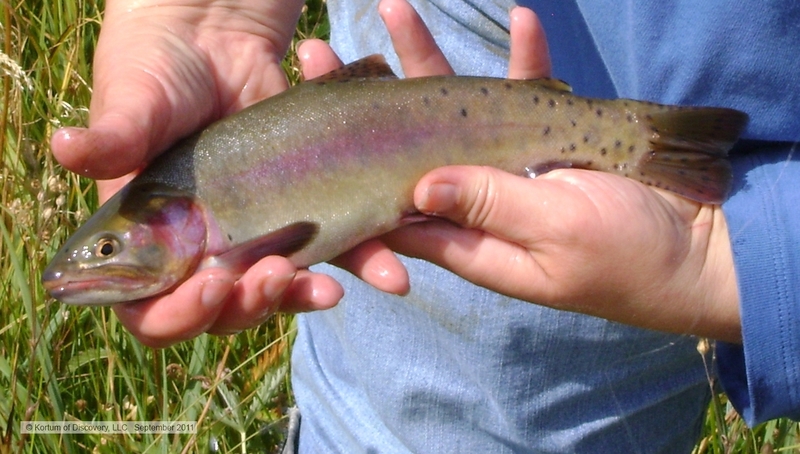 However if we do not believe the possibility then it becomes easy to dismiss these trout or their progeny as just being rainbow hybrids. If Dr. Behnke is correct — that what remains of the Alvord genetic legacy is found in this small stream — then these trout should have been safeguarded with care. Interestingly, Little McCoy Creek is in the native Alvord cutthroat trout range. It does cause one to wonder if there were not a remnant of alvordensis that had survived up until the stocking of these east-side Steens Mountain streams . . . Little McCoy Creek is not a stream that would have seemed to have been a ‘first choice’ for a Yellowstone introduction. 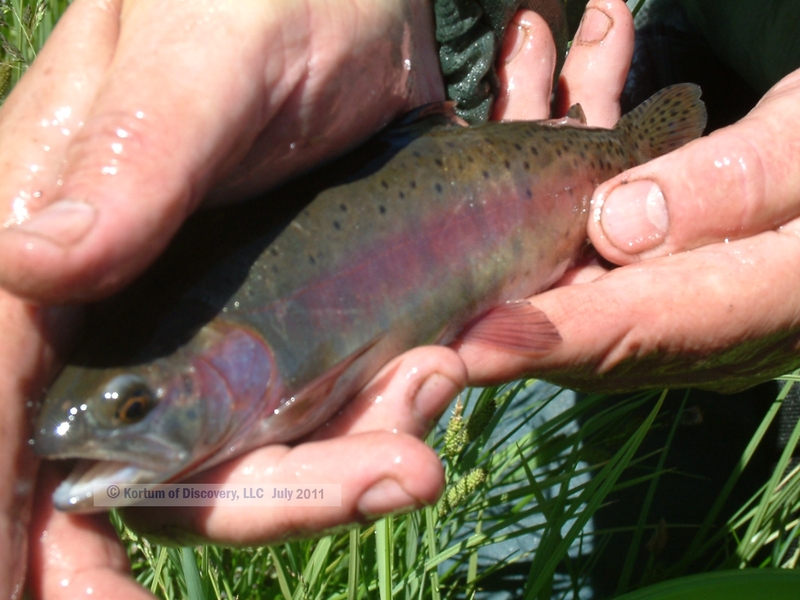 Of Three Mile Creek, Quinn River System, Nevada — it should have indigenous Humboldt cutthroat trout. Yet it is interesting to note that it is about the same distance to this stream from Virgin Creek, as Guano Creek is from Trout Creek. In fact, Three Mile may be even closer to Trout Creek than Guano Creek itself is. All of the above stated; it is equally true that Yellowstone cutthroat trout were distributed across the west by assorted methods of transportation. Although these are some of the most remote streams and basins in the country, it is within the realm of possibility that Yellowstone cutts found their way to these isolated range-land streams. 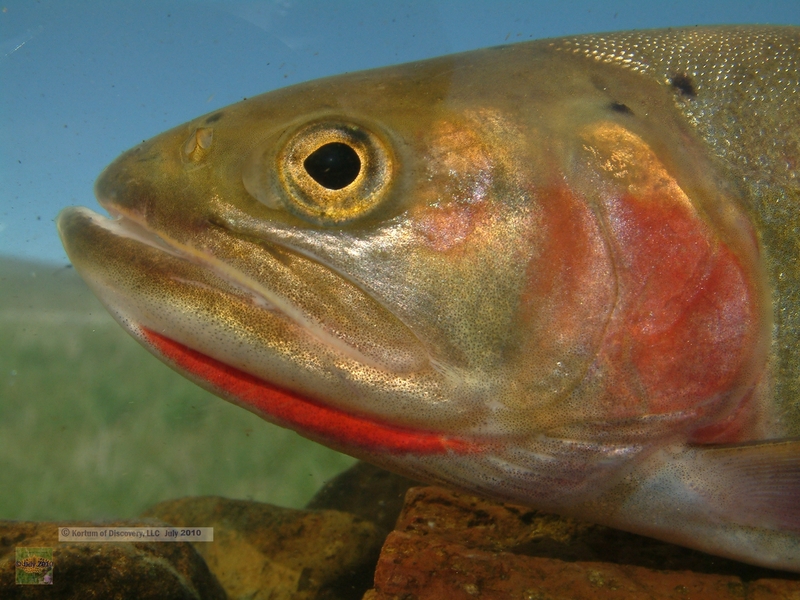 There is one element of scientific recourse that is yet to be accomplished in order to answer the unanswered questions . . . . And to be a determining factor regarding future activity where the Alvord cutthroat trout is concerned. 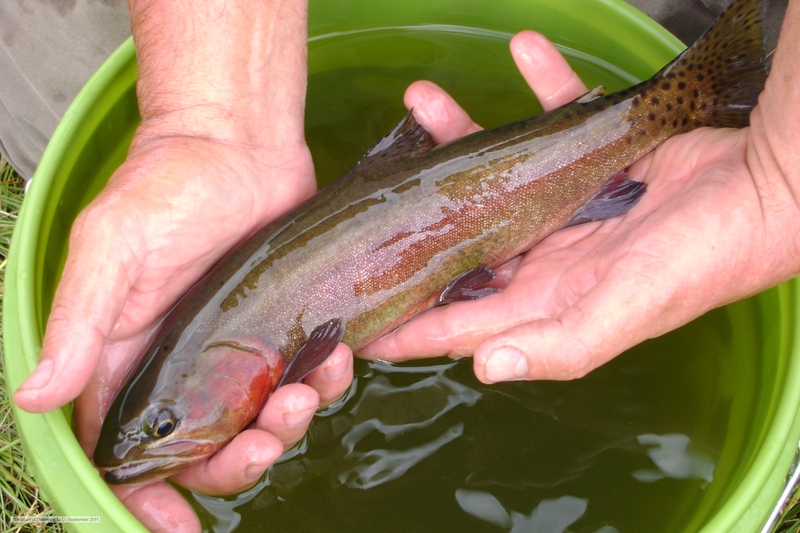 It seems unclear whether a “remnant hybridized cutthroat trout population” will persist in Guano Creek – through the throes of this devastating drought that has affected SE Oregon and several other western states . . .
For this author, it truly seems that the darkest hour has come with the loss of the Guano Creek hatchery progeny and the devastating drought affecting this stream, and the entire region of SE Oregon and beyond. Though I am hoping & seeking any miracle to put the wind back into the alvordensis sails. Surely, it has become hyper-imperative to find the means to perform genetic analysis of the Alvord cutthroat trout specimens at the University Of Michigan Museum Of Zoology in order to prevent any further loss of the prospect for revival of any remnant population of alvordensis and finally have answers for questions that otherwise cannot be ascertained. 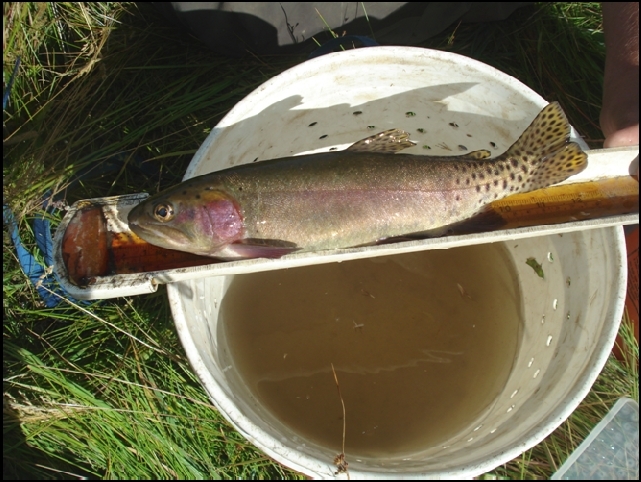 This entry was posted in ***** Creek Sampling, Fisheries Biology and Genetics, Observations, Progress - Reply - Response - Status and tagged Alvord cutthroat genetics, Alvord Cutthroat Trout, Alvord trout propagation. Bookmark the permalink. Dear Kortum of Discovery – I have followed this topic only at a distance and sporadically, and do not know the **** Creek system other than looking at a map despite having probably been close by it in the 70s (when I was a fisheries student at OSU, ironically). I did have some correspondence with Dr. Behnke years ago, calling his attention to a post elsewhere that he probably had already seen. Is there no chance of the survival of the phenotype downstream of the area that dried up? This has been a difficult topic all along and I appreciate your attention to it.